Turning to Hymn #74 and seeing the names of the poet and composer, I got excited. Isaac Watts is unquestionably one of THE great hymn poets. Evan Stephens is unquestionably one of THE great LDS hymn composers. Unfortunately, Hymn #74 does not show them in the best light. While the topic and sentiment of the text are great, the structure is inconsistent. I've written out the first phrase of each line from every verse. The strong syllable at the start of each line is bold and italicized. This is a practice I use when starting to write a hymn. I want to make sure I understand how the meter aligns from line to line and verse to verse. As you can see, there is no consistent pattern of syllabic emphasis until verse 5. Verse 6 is also in line with this patter. But verse 7, though it starts in pattern, veers off course in the last line. Traditional hymn composers build their music on texts with strong, symmetrical meters. Crafting a convincing musical setting on an irregular beat pattern is difficult. More difficult than most realize. To make each line of music fit together and feel cohesive, you'd have to give optional starts to every line. An example of this would be the start of Christmas hymn "O Come, All Ye Faithful." Verse 2 begins ON the beat. "Sing choirs of angels." Verse 1 began with a pick-up because the first strong beat in the text is NOT the first word. "O come, all ye faithful." "How Firm A Foundation" is another example. In the middle of verse 2 there is an extra syllable. To accommodate it, the composer adds an optional pickup. "As thy days may demand." I often follow this procedure when setting prose. I build a vertical chart that lines up words that could become strong beats. Because this text is poetry, those strong beats are built in. The problem is, they are not always consistent from verse to verse. So you have to spread the text out and find a way to make it work vertically with proper strong-beat emphasis. Here's an example. This is the start of each line of the first 4 verses. On Isr - a - el's God! Do you see how the strong and weak beats now line up vertically? This is the step Evan Stephens skipped over in the composition process. 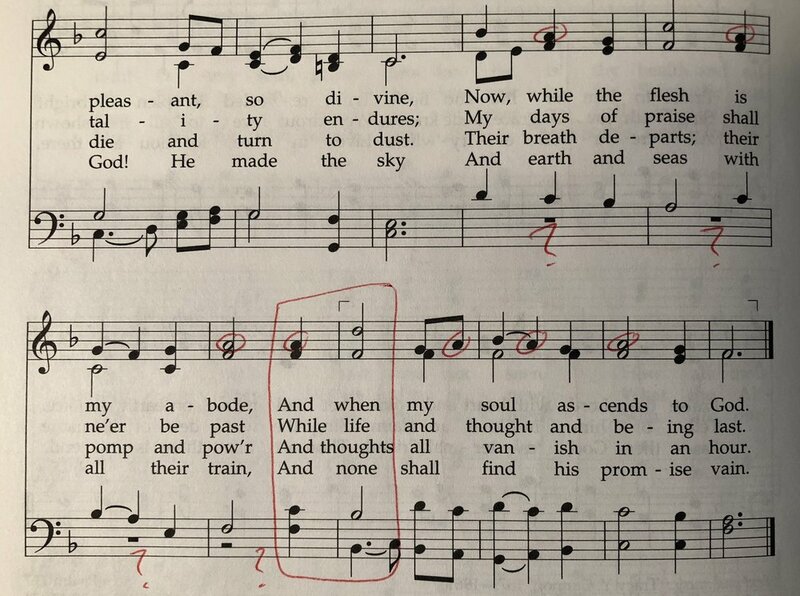 Even this great hymn genius couldn't muscle an asymmetrical beat pattern into conformity. As a result, the whole thing feels unbalanced. These unbalanced feelings are most obvious at the start of bar 5 and the start of bar 13. I have 2 other issues with this hymn. First, the "foolish man built his house upon the sand." Specifically in bars 8-12. Where's the rocky foundation? How can this house stand without a bass line? In my mind, it can't. We've talked about this before. No reason to beat a dead horse. Finally, there's an awful lot of the note A in the 2nd half of the piece. The tune can't get around to going anywhere interesting because it's pinned itself to the A. Almost every other note is an A. Enough already! So, I'm afraid this hymn gets a low grade on my scale. I don't think this one will make the cut. Unless we can get a new musical setting that actually lines up the beats in each verse, I think it's doomed. That's all for today. We've slipped back into the sealed portion a bit. We'll continue this tomorrow with a hymn I don't think I've ever sung. I’ve spoken a few times before in these reviews of the regard I have for Isaac Watts, finding him to be perhaps the greatest hymn text writer ever. I am fully in support or retaining hymns or at least texts by Watts, but this tune doesn’t do the text justice. It is a somewhat forgettable tune and has a few elements that in my estimation do not make it suitable for the text. The first element is that Evan Stephens drops the bass line out in the third phrase. The quickest way to weaken a tune the same way any structure is weakened: remove the foundation. Removing the bass line is removing the foundation of the harmonization, and it does not support congregational singing at all. It seems that folks will search for any reason to stop singing, so if a music line goes away, even if the men are singing melody, they stop singing. Not a good idea in my estimation. The second element that Brother Stephens uses that I think weakens this tune is to too prevalent use of the half note → quarter note rhythm in each measure. It seems to slow down the momentum of the tune and allows for too many pauses. These elements that I think are weaknesses in writing a tune for this particular text coupled with a forgettable melody combine to make this tune rather a poor vehicle for this text. This hymn should be felt in one rather than in three, which puts too much emphasis on each note. This is another reason that I bring up the half note → quarter note rhythm, is that finding a tempo is difficult. If you go as fast as you would need to to find a nice lilting tempo for the half notes, the quarter and eighth notes are rushed too fast. To get the right tempo for the quarter and eighth notes, the half and dotted half notes are too long. This hymn just doesn’t seem to find the just right tempo. That being said, I would probably play this around quarter note equal to 120-124 beats per minute. A would use a full plenum, using chorus reeds for this hymn as well.